A day to remember our mates who don’t ride with us anymore – Ron Rivette and Craig Fromhold. 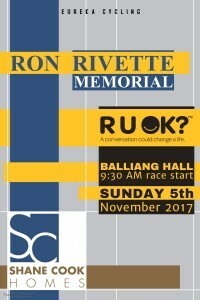 We are poorer for having lost our mates who loved cycling so much and that is why we are aligning ourselves with RU OK? A conversation could change life. 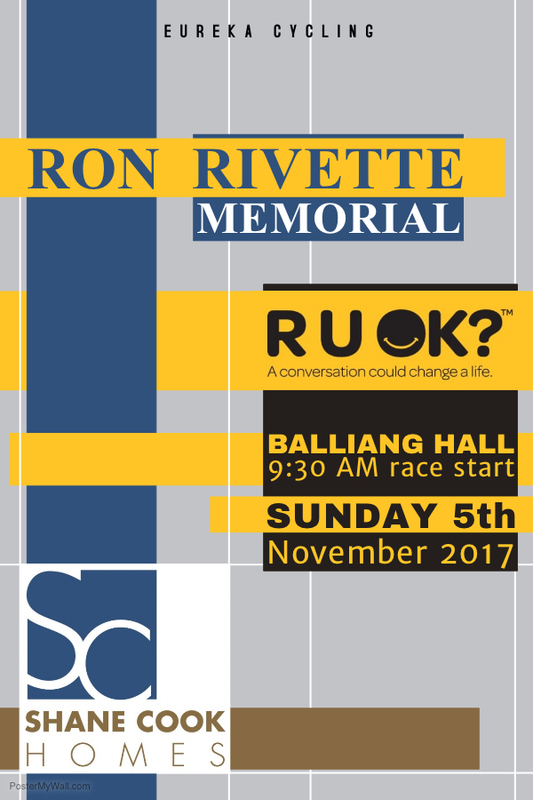 A field of 22 lined up for the fourth edition of the Ron Rivette Memorial on Sunday morning at the Balliang Hall. 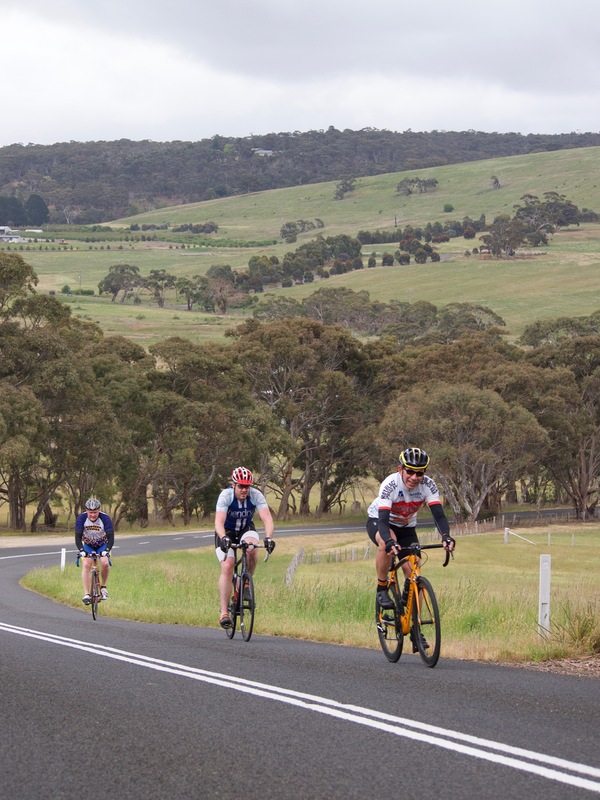 The sun occasionally peaked out from behind the clouds and even though the threat of rain had passed a cool south easterly breeze was starting to intensify and so many riders kept their layers on when the race commenced. Eastern Vets rider Brian Farrell was the first away, solo at 28 minutes. It was a long wait until the 14 minute group received instructions from race referee Terry Collie. Reigning champion Roger McMillan was joined by James Gretton (2nd in 2016), James Burzacott, Louis Nuspan and new rider Jason Hendry. To be fair, we don’t see Louis all that often, so he is a quasi new rider. It would be interesting to see how this group of experienced and novice racers would fair out on the testing circuit. Shortly afterwards the 11 minute group set off. 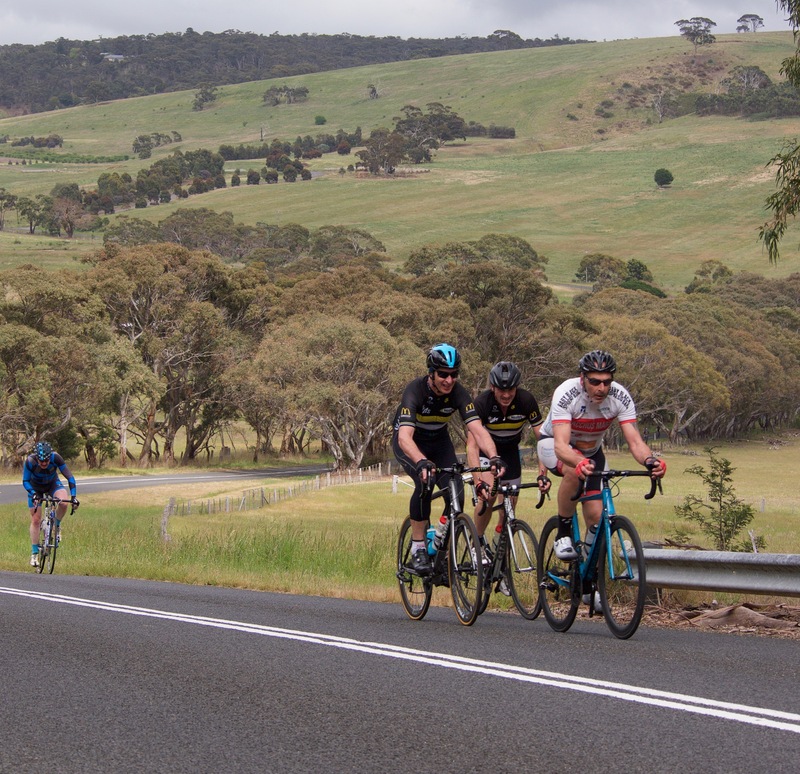 The regular grouping of Bob Morley, Peter Livitsanis, Dan Whelan and Kevin Lee are well versed in racing together, yet were under no illusions how difficult it would to hold off the rampaging hordes. Another group of mixed ability and race craft set off at 6:30 minutes. Local riders aplenty in this group with Grant Dawson out for his long awaited return. 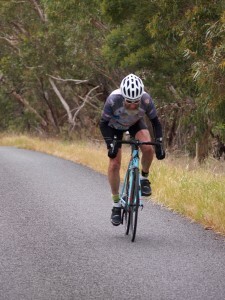 Joining him for the fray was Steve Biram donning a skinsuit and James Knipe who lives close enough to use the Balliang roads as his training grounds. 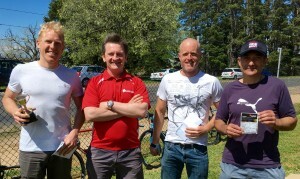 Mark O’Callaghan, Jeremy Humber and another relatively newbie – Peter Gunston – rounded out the bunch. Second Scratch were prepared to be the chopping block. On a flat course this group would revel with their powerful engines, however the Granite Road climbs made the 2:30 minute mark seem tiny. That said, it was still six riders who regularly feature in A Grade and have a swag of Fastest Times between them. Local riders Matt Ayres, Richard Taylor and semi local Matt Bowman were joined by the equally talented Rick Calvert, Paul Pickersgill and Stuart Brien. Out on course and Brian Farrell was steadily losing ground to the 14 minute group which so far was staying together. 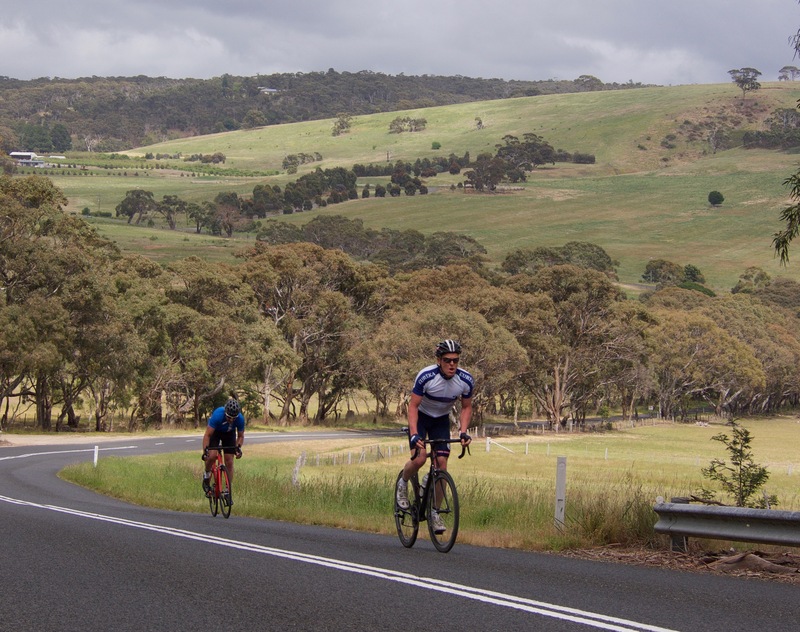 The rolling hills through Staughton Vale tested new rider Hendry and it was already evident that McMillan and Burzacott were both on a flyer. Gretton was making sure the group stayed together. 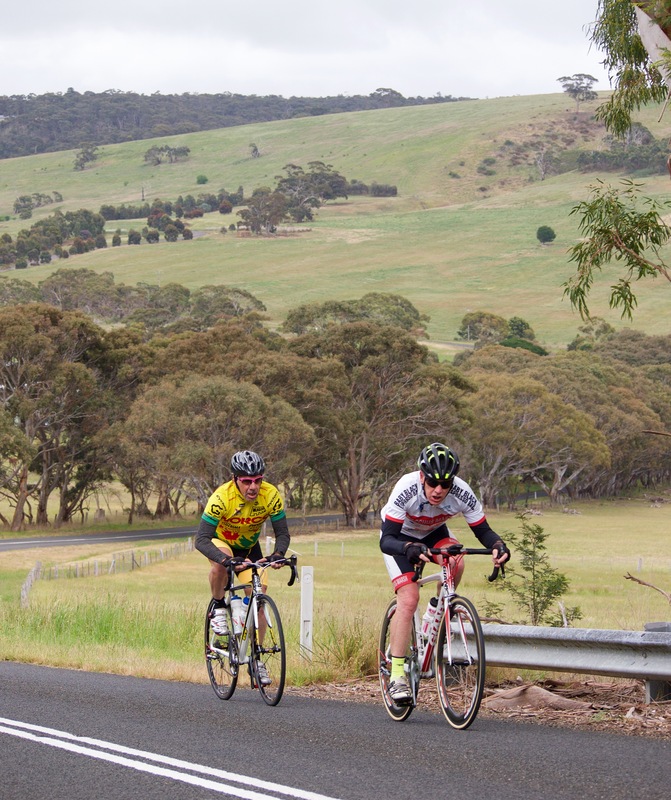 Those rolling hills caused issues for the next two groups with both losing riders. The 11 minute group saw Morley lose contact and the 6:30 group surprisingly had Knipe and O’Callaghan in trouble. Second Scratch were holding strong with Ayres and Brien pouring on the pace. The hills provided some relief for Calvert who excelled whilst his more muscled counterparts were slowed by the inclines. Scratch were already closing fast on the riders ahead and had taken close to a minute off them in the first 15 kilometres. Onto the steep Granite Road climb and the 14 minute group had the race lead. Burzacott and McMillan were controlled as they ascended the mount. Nuspan and Hendry were doing well to remain in contact and Gretton was making sure no-one was shelled. Not far behind the 11 minute group had taken big chunks of time out of the leaders. 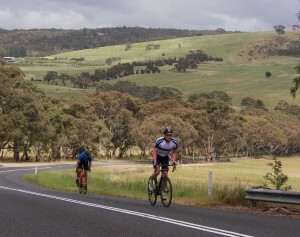 Whelan flew up the climb like a gazelle, Livitsanis was dancing on his pedals and Lee was cussing the upsloping bitumen. Farrell wove his way up the climb and behind him was Morley looking none too happy with the situation. The 6:30 minute group were next up the climb with Dawson on the front tapping out a steady rhythm with Gunston and Humber in tight order. Biram struggled with the steep section, yet only lost a few lengths before the crest. Knipe and O’Callaghan had lost a few minutes and had Second Scratch breathing down their necks – though Bowman was falling off the back, so Calvert and Pickersgill controlled the climb to ensure he could latch back on for the downhill. Barely a minute later and Scratch started the climb. 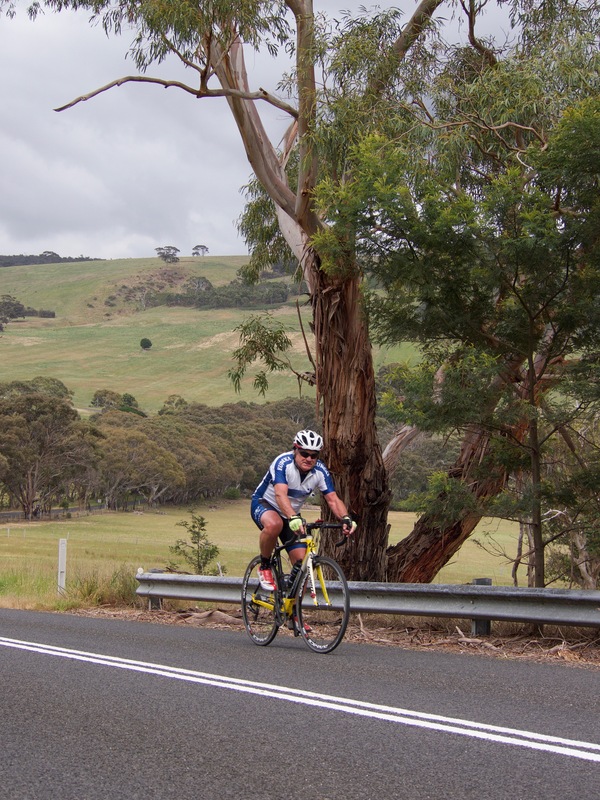 Canny was cruising up the climb, however the high speed chase has taken its toll on Mirabella who waved him on “Go forth young man and find your worth”. And he does! The eastward downhill section of Granite Road is long and fast. 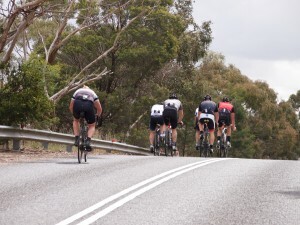 Most riders topped 60 kph as they hurtled down towards the turnaround. Once at the base of the hill the road tilts upwards slightly and the riders press forward to the U turn which always seems to be either just around this bend, or just over that rise. Finally the riders turn and can see what advantage they have over the chasers. McMillan and Burzacott were the first around the cone with Nuspan and Hendry close behind. A short gap to Gretton but then Whelan and company come into view. Dawson and his mob aren’t far behind and there is Second Scratch and Canny not far behind. McMillan and Burzacott are flying up the same hill they seemingly just descended. The south east breeze has picked up and is worth a gear or two on the 3 to 4 % grade of the lower section. The first of two steps kicks the road up to 8 % yet and is quickly followed by the second step where the road kicks up to 12 %. Nuspan and Hendry both lose touch. Gretton is in no mans land and Whelan has ridden away from Livitsanis and Lee. The 6:30 minute group has blown apart in the chase with Gunston riding clear of Dawson. Biram is pacing himself with Humber barely hanging on. Canny has swept past Second Scratch. Calvert and Pickersgill turn themselves inside out to hang on. Calvert lasts longest but Canny crests the hill with clear space behind. Taylor and Brien are chasing hard – separately. Ayres and Bowman are just off the back as the glimmer of hope to rejoin is slowly extinguished. McMillan races towards Staughton Vale and is imagining the glory of back to back victories. Burzacott is a strong partner and they can’t see anyone behind as they charge down the weaving rolling hills. Gunston is the nearest danger having caught and dispatched Whelan. Biram is putting his time trialling ability to work with Dawson and they eventually rejoin Gunston. Canny is next on the road. Calvert and Pickersgill have united in their chase. Behind them Brien whistles to Taylor who is a few metres ahead. Taylor eases and they join forces. Through Staughton Vale and the road sweeps east towards the Balliang Hall. McMillan and Burzacott hold a short lead over Canny. Three small groups have formed behind…Gretton has tacked onto Gunston, Biram and Dawson. Calvert and Pickersgill have picked up Whelan, Livitsanis and Hendry. Brien and Taylor are closing and all three groups come together with twelve kilometres remaining. Canny has pounced on the leaders. McMillan has latched on – Burzacott missed the boat. Down to the finish line and the bell rings out for one “square” lap…10 kilometres! McMillan is glued to Canny’s wheel as they turn north. 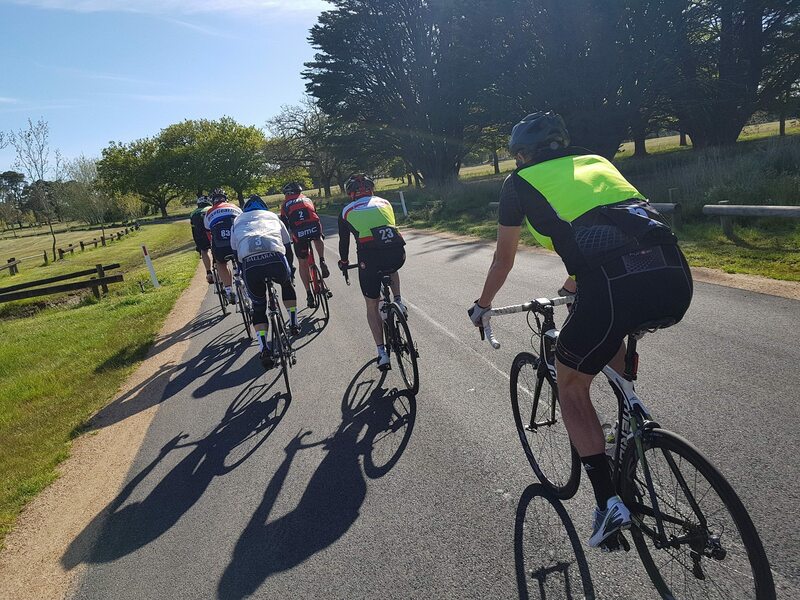 Burzacott is steadily losing ground and the eleven man chase group receives the bell just three hundred metres back. The Second Scratch riders aren’t happy with all the passengers they have picked up. Calvert throws caution to the wind accelerates into the turn. Brien kicks as they straighten and riders are scrambling for wheels. A few don’t have the leg speed and fall off the back. Calvert and Brien repeat the dose at the next corner. Pickersgill and Taylor give support and they have dropped all bar Biram and Gunston. Four kilometres remaining and Canny takes the second last turn at speed. His rear wheel skips, slips then grips. McMillan isn’t quite as game and finally he has lost the wheel. The chase group are dawdling and just rolling through, some not even that. McMillan is just up the road and they are gaining, but not quick enough. Brien, Calvert and Taylor try to wind the pace up higher. There is not so much reluctance to help as an inability to help. Second place is just up the road – chase hard, chase now! Into the home straight and Canny is completing his virtual victory lap, having been in the lead for the last eleven kilometres. Down to the flag and Canny has smashed this one completely out of the park with quite possibly his best performance with Eureka yet! 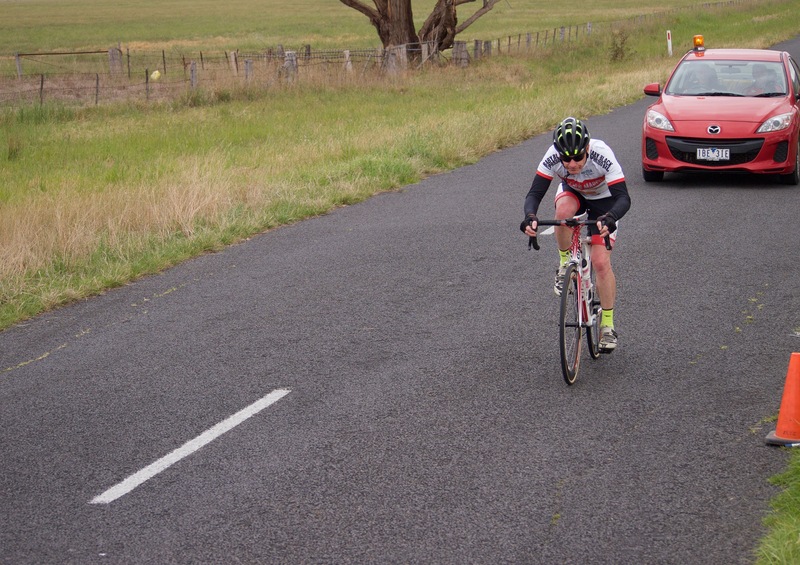 McMillan still holds down second, though the headwind in the home straight is a lot tougher when riding solo. He looks to his left and can see the chasers coming up to the turn – his margin is slim. 300 metres to the finish line and McMillan is still fifty metres ahead. Brien and Taylor are leading the chase, burying themselves and getting closer to McMillan with every stroke. 100 hundred metres to the line and he is still clear. Brien and Taylor are fading, Biram comes through down the centre of the road and Gunston is sprinting out wider. 50 metres from the line and they surge past McMillan. Gunston edges ahead of Biram for second, Pickersgill a length back in fourth, Taylor and Brien a blur, then the courageous McMillan ahead of Calvert who had been blocked behind a wall of riders in the sprint. 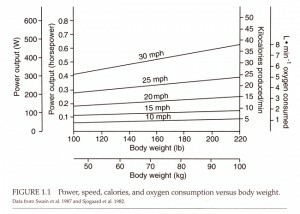 F = Aerodynamic drag force in Newtons. Ralph Jones (aka James Gretton) made the 63 kilometre handicap around the Coghills Creek circuit his own today, racing away in a strong solo effort to an emphatic win. 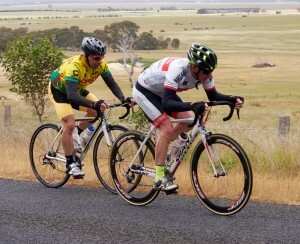 Riders arrived to find misty rain sweeping across Learmonth and a southerly wind which was increasing. By race start time the threat of rain had passed along with a noticeable rise in temperature. John Faulkner (Limit) led out the field on his lonesome at 27 minutes. Terry Collie (also riding in a solo capacity) was next away at 21 minutes. It was a long wait until the first actual bunch of riders set off at 14 minutes, where handicapper Peter Livitsanis slotted himself in with Danny Whelan, James Gretton, James Knipe, Kevin Lee and regular visitor Noel Said (Northern Cycling). The Second Scratch (3 min) group set off a whopping 11 minutes later with Mark O’Callaghan, Rick Calvert, Richard Taylor, Matt Ayres and Stuart Brien joining the “in form” Peter Canny. Last away was the Scratch group led by Club Champion Greg Ley. Late arrival Jim Crumpler joined the ranks which also included Tony Mirabella, Dean Wells, Craig Lee and Paul Pickersgill. 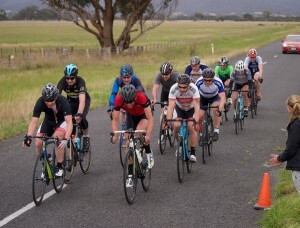 With twenty riders out on course the key to victory in the windy conditions appeared to be as simple as “the bunch who works together wins”, especially with nine of the riders backing up after racing with sister club Ballarat Sebastopol the previous day. Riding solo did not augur well for the soloists John Faulkner and Terry Collie. Faulkner lasted two laps before retiring and Collie was swept aside by every group before also retiring. 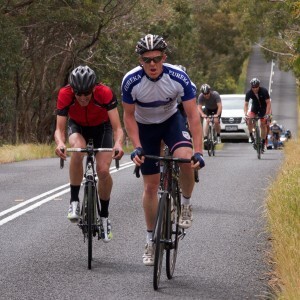 The three groups of six riders faired much better out on course, however each suffered early casualties. Richard Taylor (3 min) was the first rider out after he hit a pot hole and flatted just nine kilometres into the race. 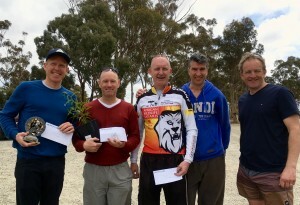 Scratch lost Jim Crumpler after their frenetic chase and surging split the group through Coghills Creek. 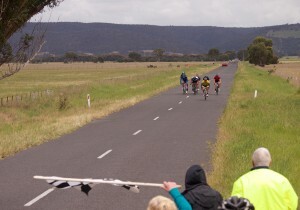 The 14 minute group also lost a rider when Peter Livitsanis flatted on the first lap early in Donovans Road. 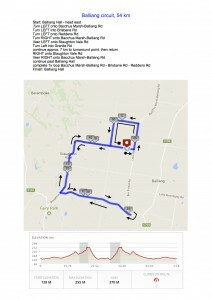 A consistent theme with each of the (now) five man groups, was that one or two riders in the groups were doing the lion’s share of the work, maybe even dominating… Whelan and Gretton led the charge for the 14 minute group, Ayres and Brien were powering the 3 minute group and Mirabella was clearly above the pack in Scratch. Cohesive turns were important for a group’s survival and some were doing it better than others! It was on the second lap that first Collie, then Faulkner were rounded up by the hordes. The 3 minute group found themselves another man down after O’Callaghan trailed off heading up past the quarry. The remaining four riders kept their rotations orderly – rolling turns with the tailwind and track turns into the head wind. Having only made up 30 seconds on the first lap, Scratch finally found their mojo and started to work well together. They would take another 40 seconds on this lap, however they lost Pickersgill after the hairpin bend at the top end of the circuit. 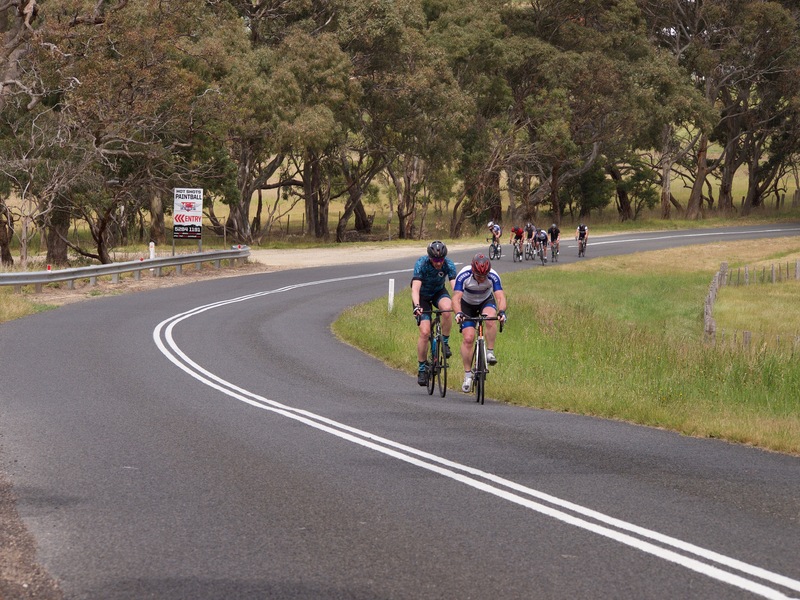 Now in the race lead, the 14 minute group were working as best they could with the varying physiques they had available and they couldn’t see anyone behind. Onto the third and final lap and the 14 minute group started to dream big. Knipe lost contact heading past the quarry. The remaining four rallied, knowing that the tailwind to Coghills Creek could make all the difference. 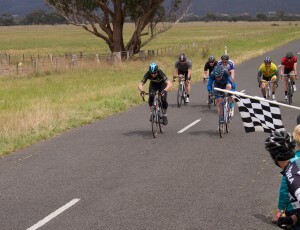 The 3 minute group had the race leaders in their sites, however the gap was still large and would require an even greater effort to make the catch. 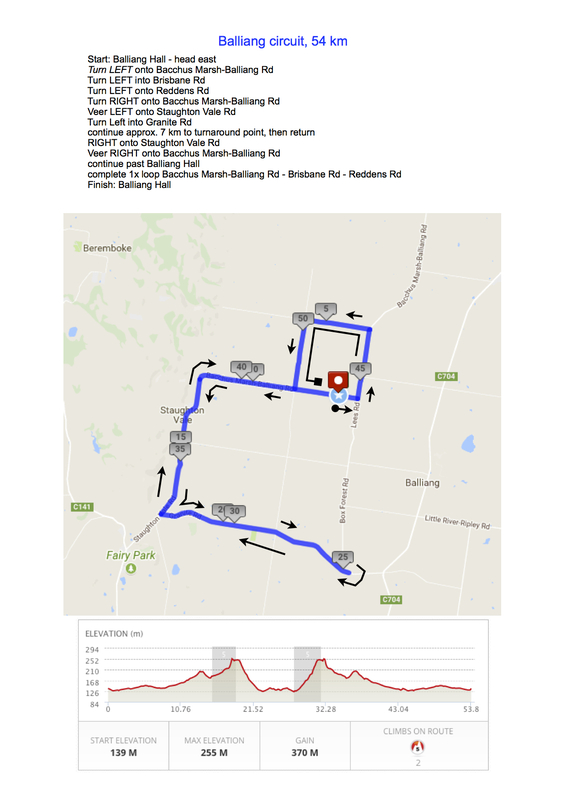 Scratch were still taking time out of those ahead as they raced up the hill on the south side of the circuit, however disaster soon struck when Mirabella’s power drew him away from the group and a fifty metre gap quickly opened. All cohesion was gone as the remnants of Scratch struggled just to try and catch up with Mirabella again. At the head of the race and the 14 minute group realised they had a huge chance of causing a boilover. 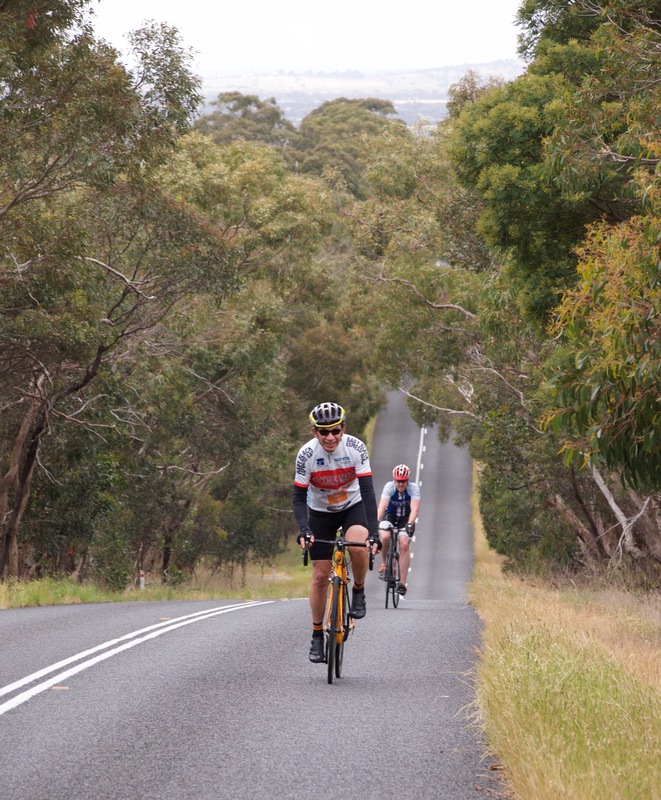 The next bunch on the road was back at the bridge near Blowhard – over one kilometre behind. ‘But the hour cometh, and now is’. Gretton gave a cry of “let’s go” and powered to the front with Whelan, Said and Lee all scrambling for his wheel. The 3 minute group could barely make out the leaders on the horizon. They looked behind and struggled to see anyone. Beating Scratch home would be a victory in itself! Scratch were coming, however Mirabella was still out on his own. The others finally linked back up racing through Blowhard. The gap to the bunch ahead was under two minutes, so the catch is unlikely and they are now just racing for Fastest Time. 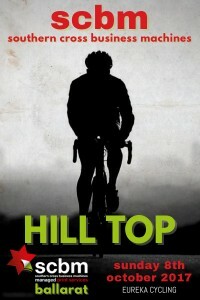 Wells was shelled on the next climb and just three remained. 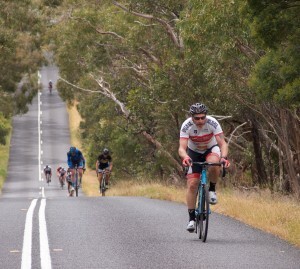 Gretton was still on the front as the race leaders are neared Coghills Creek. He turned around to see that he has dropped his bunch. With ten kilometres to race he makes the decision to GO! Whelan, Said and Kevin Lee have watched the all powerful Gretton ride away from them. Maybe they could still claim all the minor placings if the headwind after the hairpin doesn’t rip them apart…but maybe, their bell has tolled. Ayres, Brien, Calvert and Canny still worked their turns. They didn’t know the lead group had started to disintegrate, but they did know that Scratch was still a long way behind. No further encouragement needed! 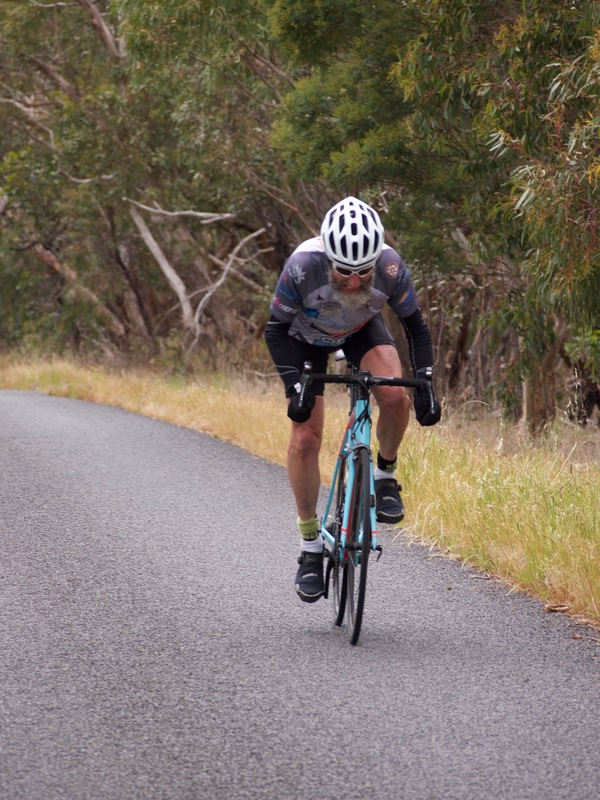 Scratch raced through Coghills Creek and Craig Lee was off the back, leaving just Mirabella and Ley to continue the chase. Gretton was through the chicane and onto Donovans Road for the final time. He batts away the headwind and focuses on the now. His former cohorts have blown apart and are strung out in their own battles. Second Scratch catch Knipe who has continued on after being dropped back at the quarry – he offers that they still have a chance. Soon after and Ayres bids his mates adiue and eases off the back – stuffed! Brien, Calvert and Canny continue on, they catch and drop Whelan. Lee is the next rider up the road. He cannily jumps onto the 3 minute express as it flies past. 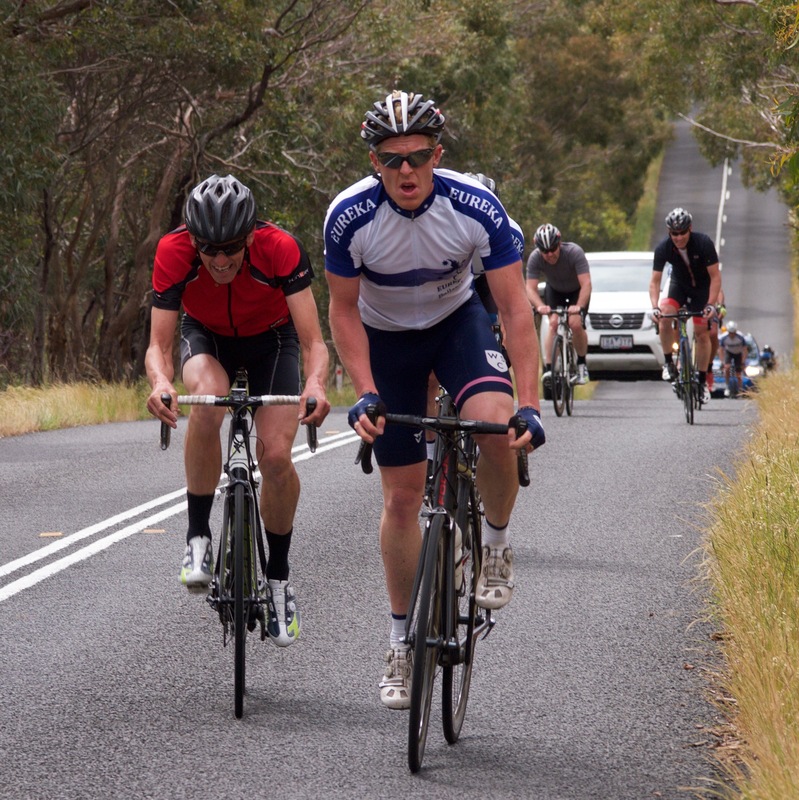 They see the next rider ahead (Said), however they don’t realise Gretton is charging towards a famous victory. In fact, they don’t even realise they are now racing for a minor placing. Mirabella and Ley are still chasing, however they are losing their hard fought time over the Second Scratch group. Fastest Time should be safe though…shouldn’t it? Said comes through in second place. Brien and company are still rotating turns and don’t even really bother to sprint as they near the line. Brien takes third and Canny is fourth. Kevin Lee knows he can grab a placing and he whips around Calvert at the line to claim fifth. Mirabella and Ley aren’t far away. They are now foxing each other in the run to the line for Fastest Time. Unbeknownst to the pair the stopwatch has counted on so far that they may even have fallen in arrears. Ley makes a late dive and claims a victory over Mirabella. 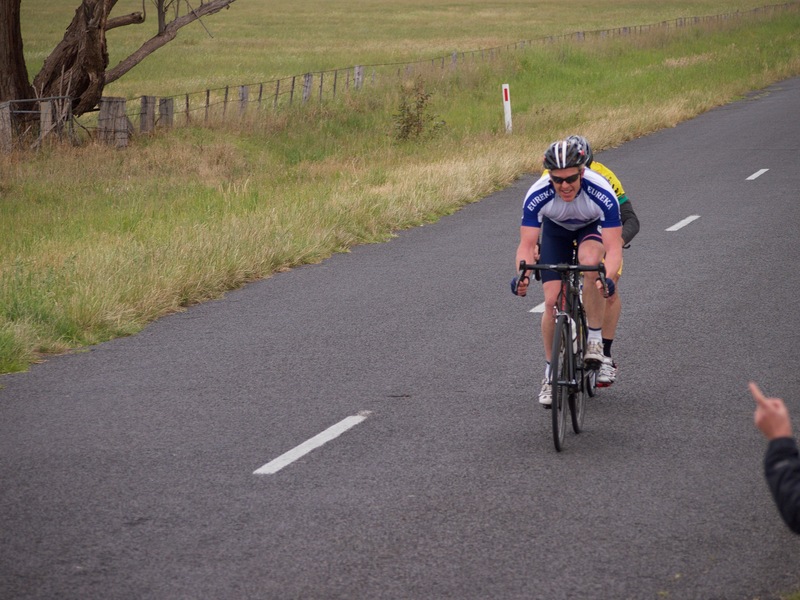 *A recheck of the times in the clubrooms eventually shows that Stu Brien from the 3 minute group has ridden the Fastest Time on this day. 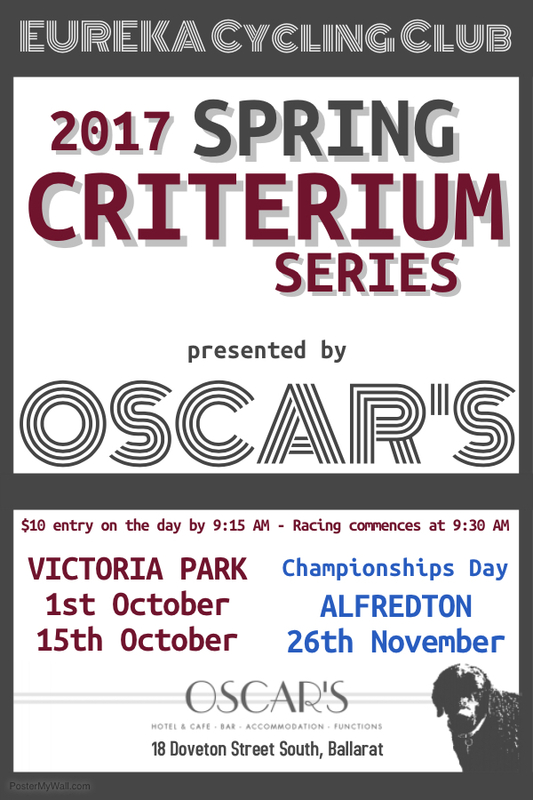 Twenty six riders converged on Victoria Park for round 2 of the OSCAR’S Hotel & Cafe spring CRITERIUM series. 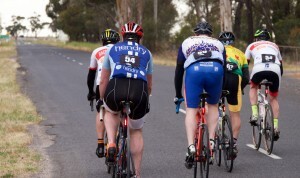 Eleven of those riders were backing up from racing the Camperdown to Warrnambool on Saturday. Also backing up from a busy day was John Faulkner and Lois and Bill Goldfinch. 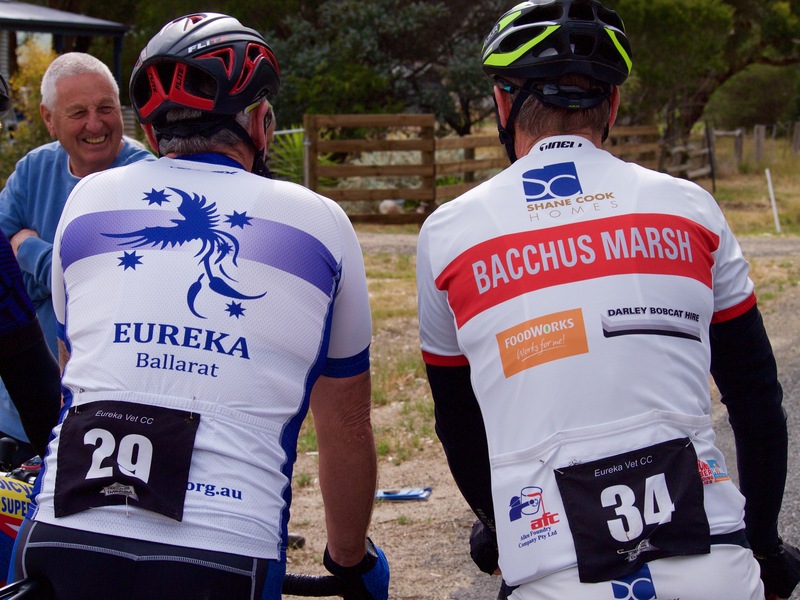 EUREKA Cycling welcomed some visitors to the races with Peter Gunston out on trial again and Mandy Hosking travelling up from Geelong to race. 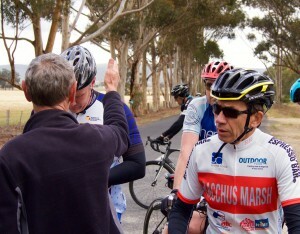 Brian Long chauffeured Mandy up to Ballarat then volunteered to marshal a corner. This didn’t impress Terry Collie who lightheartedly complained post race “I had to race because Longy did the corner”. There were quite a few interested onlookers at todays’ criteriums including Veronica Micich and Shane Miller who are keen to join up with EUREKA Cycling for the 2018 season. 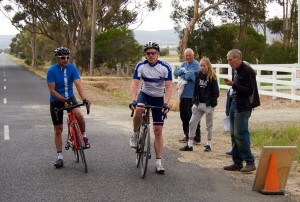 We also spotted Brad Eppingstall and Neil Braszell checking out the super smooth crit circuit. Ten riders presented for the Division 1 race and promised to be a hard race over 50 minutes plus two laps. 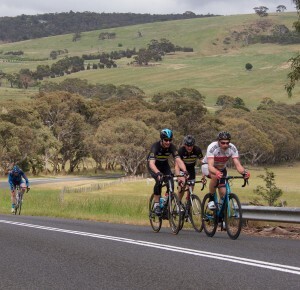 Attacks, chases and an average over 40 kph saw that everyone felt the hurt… Tim Canny, Tony Mirabella and Dean Wells were backing up from the Camperdown to Warrnambool the previous day. Jeremy Vanderklift, Stuart Brien and Craig Lee were out racing for the first time in a while. Rob Phillips is on the come back trail after suffering the dreaded man flu. All eyes though were on Matt Bowman. After he dished out much pain in the first round of the spring criterium series his opponents intended to keep him on a short leash. Riff Raff duly launched the first attack of the day – this was quickly marked and all subsequent attacks by Bowman were followed so quickly that he often shut down the booster jets before they reached full power. Canny on the other hand found it easy to ride off the front early in the race. He spent time alone pondering sciencey things before being roped back in. Mid race and away he went again for a few laps. Schiemer, Brien and Matt Ayres did the bulk of the chasing to bring him back, Bowman took over and drove the pack, yet just before the catch was made Canny rallied again and opened a large lead. 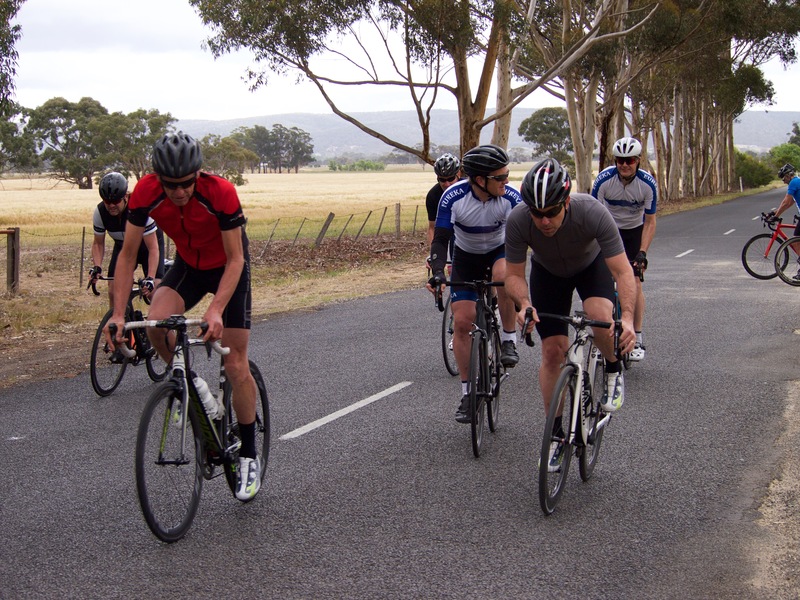 Finally the bunch regrouped a few laps later. Mirabella was looking to press his own attack, however the fast pace made venturing off the front a large gamble. Bowman found himself stuck on the front at the bell and no-one was letting him get off. He started to lift the pace from 700 metres out. Wells pushing the 53×11 was the first to go at the turn. Canny was stuck to his wheel and everyone else was scrambling for position. Inside the last fifty metres and Canny surged through on the inside of Wells and raced away for the win with Lee and Schiemer coming down the centre of the road to claim the minors. The largest field of the day was Division 2 with eleven rolling out from the start for 45 minutes plus two laps. 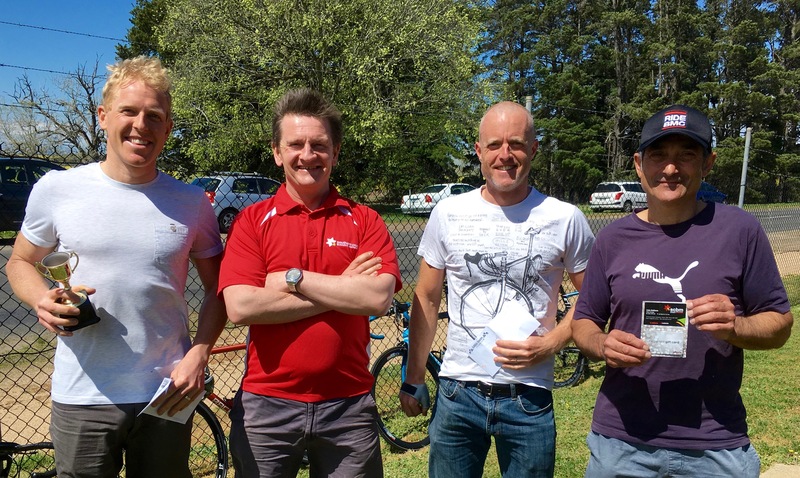 Rick Calvert, James Gretton, James Knipe, Mark O’Callaghan, Danny Whelan and Amanda Hosking (Geelong & Surf Coast) were all backing up from the Camperdown to Warrnambool and they made their presence felt in todays race which averaged just over 37 kph. Steve Biram was spritely early and had the field stretched out as they came around to complete the first lap. Attacks throughout the race where punctuated by “go slows” where the speed dipped below 30 kph, however much of the race was ridden at tempo. 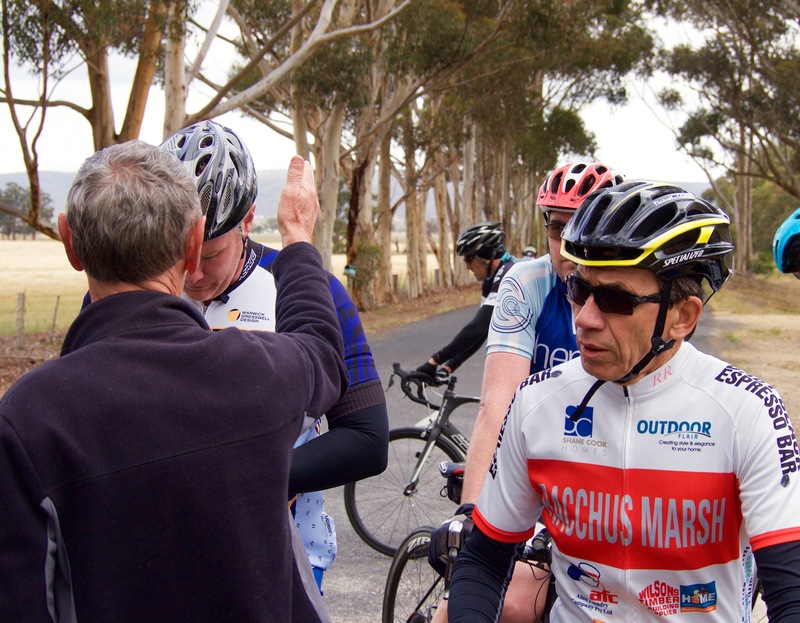 Hosking rarely relinquished second wheel and Pete Livitsanis was present at the front of the field ensuring anyone who drifted off the front was left dangling for a lap or two. Whelan kept the pace on, whilst Gretton and O’Callaghan hung about the tail biding away their time. Calvert felt every pedal stroke after his efforts the day before and Knipe was in auto-cruise. Kevin Lee impressed once again and Bob Morley was wondering if he would have better legs had gone to one less hippy jazz bar in recent weeks. 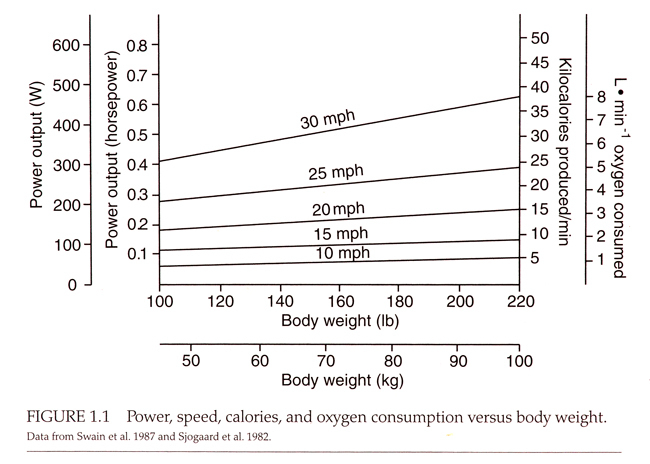 Bell lap and the pace ramped up after the tight left-hander. With 500 metres to race the pace was pushing 50 kph and it only got quicker as the field swept into the home straight for the flag. 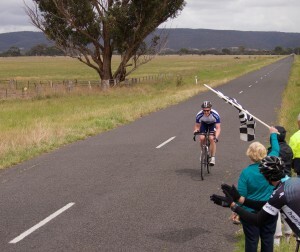 At just his second race with EUREKA, Peter Gunston unleashed his massive sprint with precision timing to claim the win from Knipe and O’Callaghan. Raced 40 minutes and two laps the Division 3 race saw Ken Heres out for his first race in two years. 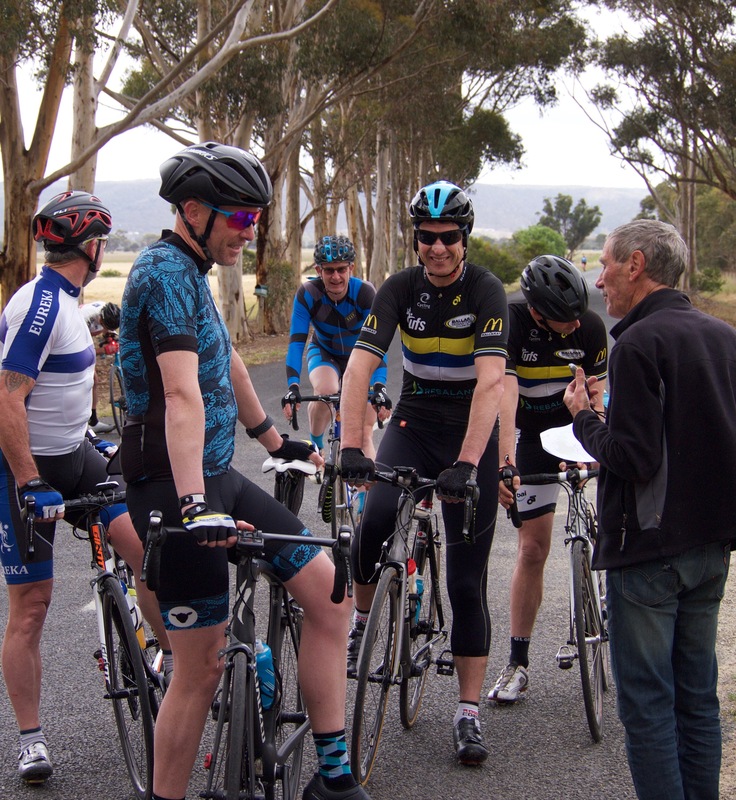 Heres was joined by Phil McLennan, John Faulkner and two riders who were backing up from Camperdown to Warrnambool – Terry Collie and Graeme Parker. Early action saw Faulkner dispatched out the back. Collie was caught in no man’s land and the other three were away. The pack regrouped, however Faulkner eventually retired, leaving just four to battle out the placings. Heres took the win with a strong sprint from the fast finishing Parker. McLennan rounded out the podium. 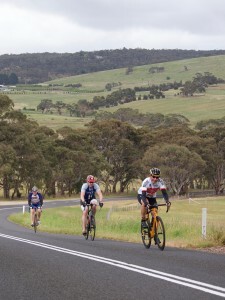 Strong northerly winds made the Southern Cross Business Machines HILL TOP a true classic race. 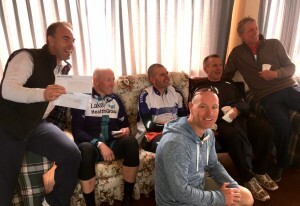 Twenty three riders battled the conditions around the Mount Misery circuit before ascending the infamous Harrisons Road climb to fight for the “King of the Hill” crown. 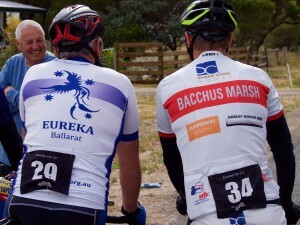 John Faulkner turned out in his kit today for a rare race with the club he presides over. Setting off alone at 25 minutes Faulks was soon struggling into the headwind up Edmonston Road – he wasn’t Robinson Crusoe in that respect – before finding his mojo and powering around to Ercildoune Road. From there the game got tougher and he picked up by bunch after bunch before “missing” the left hand turn into Edmonston Road and cruising back to the club rooms. Graeme Parker and Terry Collie set off just four minutes later in pursuit of Faulks. Sharing the load made for an easier time than other races when they have been the lone wolf off limit. 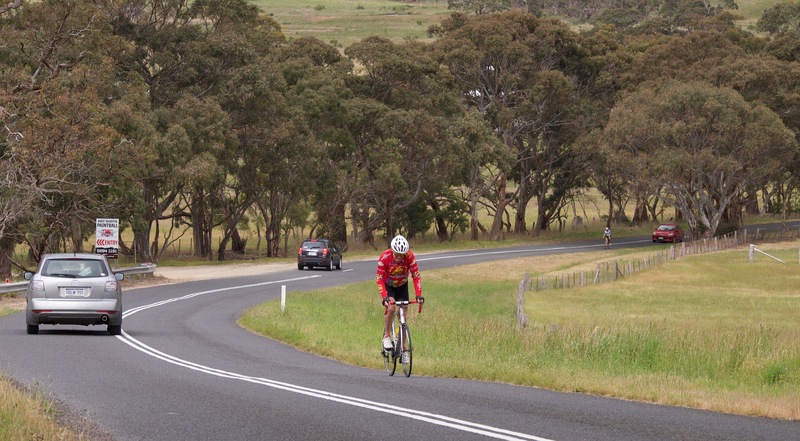 Collie eventually rode off from Parker – who is still returning to race fitness – heading up Ercildoune Road. Parker was then caught by the combined 14 and 11 minute groups with ten kilometres remaining. The fourteen minute trio has not seen much racing action recently and it was with a sigh of “do we have to?” that they eventually rolled away from the start line. Race Referee was heard to say ‘You weren’t meant to see that.’ to the other riders queued up in anxious anticipation. Out on course and James Burzacott, Roger McMillan and Ralph Jones the rider previously known as James Gretton quickly moved into hurt/survive mode on the road to Addington. Once they picked up the cross tailwind they flew along Langi Kal Kal Road and smashed it down Black Bottom Road. They struggled up Ercildoune Road like every bunch, however they were soon swept up by the ten minute group and joined in the pacing. Had it not been for the wind, the ten minute bunch would have been licking their lips with their mark. 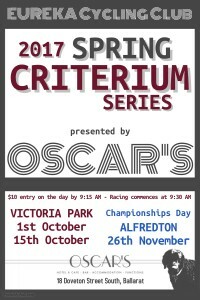 This race fit bunch of six were present throughout the whole winter series and have set themselves up for a great spring. Today…Jeremy Humber, James Knipe, Brian Ure, Kevin Lee, Danny Whelan and Peter Livitsanis rode their giggleberries off in pursuit of the riders ahead. A noticeable slowing of the pace once they caught Parker and Team Jones put paid to any chance the bunch had. Parker even slotted in and started working turns to keep the pace respectable. Riders were sizing each other up almost as if they had forgotten that they were being hunted by the back markers. There were some itchy trigger fingers and early marking as the enlarged bunch started to ascend the Weatherboard climb in pursuit of Collie. Knipe eventually attacked and Humber followed. They cleared out from the bunch, but would they survive? The three minute group was cobbled together with those who couldn’t make the cut for Scratch. Jim Crumpler arrived ready to marshal, yet ended up racing in civvies. Preparing for his next great biking adventure, “Lever” struggled then lost contact on the steps near Waubra. Peter Canny has been training hard to assume his rightful position in Second Scratch and Peter Kiel clearly circles the races with hill climbs at the start of each season. Kiel races honest on the few times we see him each year and today he slotted in and assumed the leadership role like as though he had been racing all year. Scratch were licking their lips today…well Matt Bowman, Greg Ley and Jason Birch weren’t, but Tony Mirabella and Tim Canny were pumped. “Riff Raff” Bowman expected a hard race however he was shelled early and then retired so that he could cheer everyone up the climb. Birch and Ley turned themselves inside out just to hold wheels let alone contribute to the maddening pace that Canny and Mirabella drove. In fact Canny led the bunch for many a long turn as they chased the 3 minute group which just would not come back to them. 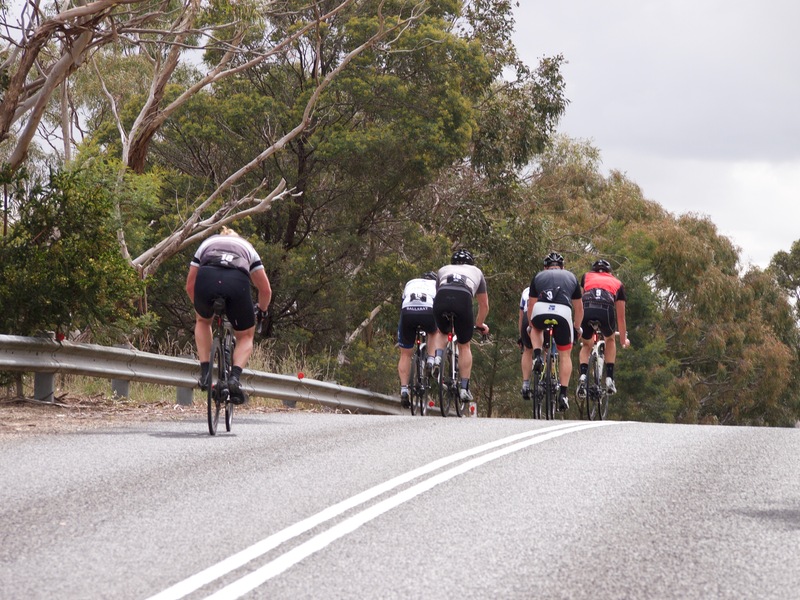 Eventually they made the catch just ten kilometres from the finish – on that little rise one kilometre out from the left turn onto the Weatherboard climb. Canny hit Second Scratch hard and opened a gap which he never relinquished. Mirabella planned to let the gap widen before jumping across but then he found himself with Ley in no-mans land ahead of Second Scratch which was rallying behind with the added firepower of Birch. Ayres drove the chase back to Ley and Mirabella, then Kiel started swapping turns and urged everyone to work – a pipe dream as it was all anyone could do just to hang on. Onto the Weatherboard climb and the virtually the whole field is present. Collie has the race lead and crests the hill with Knipe and Humber in pursuit and they soon claim him. The remnants of the 10 minute group are pacing themselves, although they have dropped Lee and Parker. Canny works his way past the distressed riders and detects a whiff of victory. Mirabella and Ley drive the chase with cameos from Wells and Ayres. Over the crest and the bunch starts working turns to catch the rest of the field. Into Edmonston Road for the run towards Harrisons Road and Canny has swept to the lead with Humber in tow. 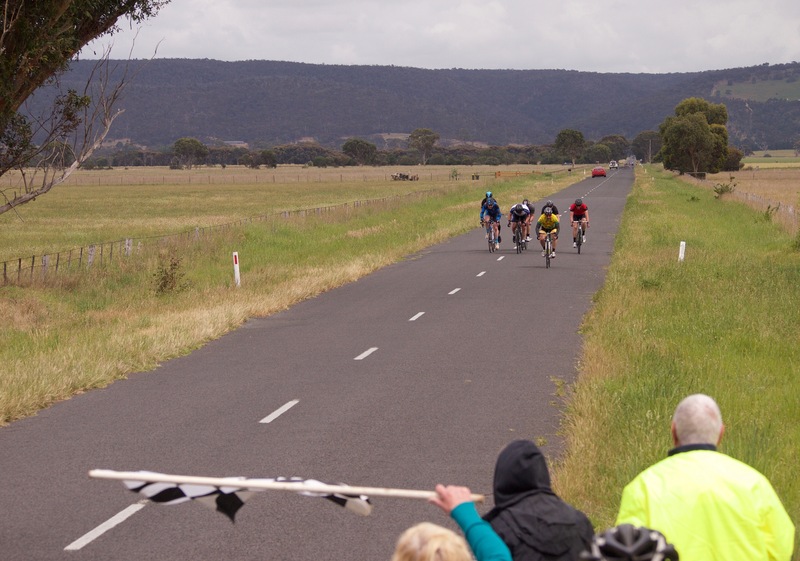 One hundred metres behind the ten minute bunch is soon caught by Mirabella and Co. Ley and Mirabella brunt the headwind and assume responsibility for the chase as Canny drops Humber and is riding towards victory. Wells comes through and swaps turns with Mirabella before Ley then Ayres try to ramp the pace up and drop the riders from the ten minute group who are hanging on. Towards the turn into Harrisons Road and Canny is riding towards the crown. Wells leads the chase and drives the pace to split the field. Mirabella launches as they turn onto the climb, he can’t catch Canny however he can claim second. Ley, Birch, Calvert and Kiel chase, but Mirabella has the gap and looks to have sown second place up. Canny rides to a clear victory and is back at the finish line to watch the rest of the race finish. Ley surges halfway up the climb and gets a small gap over Birch. Calvert chases and Wells rallies to claim Kiel not far from the finish. Pete Canny and Matt Ayres claim top ten places as does Danny Whelan who finishes 9th.